Oops - we don't appear to have a video for the DR-2020U. The scanner is absolutely brilliant! I'm surprised there is anything left in the world for me to scan, I've scanned so much!! It has helped me tremendously in my work as a teacher. The scanner is very fast and very easy to use. It still amazes me how quickly it can duplex scan! I cannot say enough positive things about the scanner! It is simply fabulous! I would definitely recommend it to anyone. It was well worth the money and has easily saved me hours of work already - although it has given me hours of work as all of my work colleagues give me their stuff to scan too! However, as the scanner is so quick and easy to use, this is not a problem! With regards to marks out of 5, I would have to give the scanner a 10! The easy-to-use DR-2020U offers affordable high-speed duplex scanning for small and home office users, and also for corporate business departments – without compromising on quality or features. A compact scanner with an attractive sleek, black design, the DR-2020U comes equipped with three versatile scanning options that make it ideal for handling a wide range of document types – from a large batch of invoices or reports to books, delicate archive records and customer business cards. Advanced imaging features provide the highest-quality results, with features such as Punch Hole Removal, Auto Size Detection, Deskew and Advanced Text Enhancement, ensuring crisp clear images are consistently produced with a reduced file size, for faster processing. Colour Reports and photos can be perfectly captured with exceptional precision quality too using Canon’s cutting-edge 600dpi imaging sensor technology and 3-Dimensional Colour Correction processing. Even users who are unfamiliar with scanning will find the DR-2020U extremely quick and easy to operate. Its intuitive user control panel has 3 illustrated buttons for the fast and effective ‘one touch’ execution of frequent scanning tasks, such as scan-to-email, scan-to-folders and scan-to-printer. 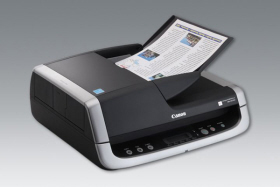 Canon’s CaptureOnTouch software further simplifies scanning, reducing errors and saving valuable time. Included with DR-2020U is a comprehensive and versatile software pack with tools for efficient and effective document capturing, editing, filing and management. Users can also now send image files directly into Microsoft SharePoint or other applications using the included PaperPort software. Other useful software provided is Canon’s CapturePerfect 3.0, Presto! BizCard, Nuance OmniPage and Adobe Acrobat Standard edition. The DR-2020U is Energy Star compliant, and can also be automatically switched on or off in line with the PC to which it is attached.